Home » Education » Special Education in Virginia: What is an IEP? As a parent or guardian you want what is best for your child, including ensuring that your child is receiving an appropriate education. If your child has been identified as requiring special education then your child is entitled to have specialized instruction to suit their needs. This specialized instruction is written down in an individualized education plan, or IEP for short. Following a landmark case in 2017, the standard which the schools need to meet in providing your child an education has changed. Previously all a school needed to do was show that an IEP was reasonably calculated to provide some educational benefit. That old standard worked in favor of the schools. This is because some educational benefit was determined by the courts to be a very low threshold for them to meet. Now that standard has changed, and it is more in favor of you and your child. Schools now must make IEP’s that are reasonably calculated to enable a child to make progress (in their education) appropriate in light of the child’s circumstances. To meet this new, higher standard, schools now will need to consider a child’s present level of abilities and their potential for growth. Then they must specifically design the program around that. 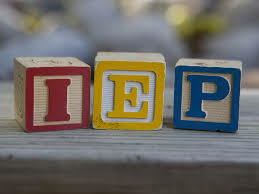 While an IEP has always been individually tailored, now it is even more focused on ensuring that everything your child receives is related to their specific needs. What a school cannot do is adopt the same IEP year after year, especially if your child is not seeing any progress under that IEP. If your child is not making progress under an IEP, then the school must change it in order to ensure the IEP is designed to allow your child to make progress. Neither standard ensures a specific educational outcome that if not achieved you may sue. The standard is in place to ensure the school is providing the services necessary to give your child the opportunity for that education. If the school fails to provide the services, accommodations, or meet the procedural requirements that they legally need to meet, then you do have options before you, possibly including filing due process against them. If you have questions about special education, or advocating for your child’s educational needs, please don’t hesitate to reach out to the attorneys of Winslow & McCurry at 804.423.1382 or email us at info@wmmlegal.com.